Muddy Loafers: ELSA BRANDSTROM – PATRON SAINT OF SOLDIERS. ELSA BRANDSTROM – PATRON SAINT OF SOLDIERS. MARY HOLTE – GREY GHOST OF ASTON HALL. A small sign “Elsa Brandstrom Street” near the Rhine in Bonn piqued my curiosity. Who was this woman? I learnt that there were many schools, institutions and streets named after her in Germany and Austria. Elsa was a Swedish nurse and philanthropist. She was born on March 26th, 1888, in St. Petersburg, when her father Edvard Brandstrom was posted as Military Attaché, at the Swedish Embassy in Russia. But she grew up in Sweden and completed her education at the Anna Sandstrom Teachers’ Training College in Stockholm. Years later, when her father now a General, was posted as Swedish Ambassador to the court of Tsar Nicholas II, Elsa returned to Russia and volunteered as a nurse in the Russian Army, during World War I. In 1915,Elsa was sent to Siberia under the Swedish Red Cross banner, to care for German and Austrian prisoners of war, as they were treated very badly by the Russians. This tall, blue eyed, blonde young woman brought solace to many ill and demoralized soldiers who suffered from malnutrition, Typhoid, and other diseases of the gastrointestinal tract. It earned her the name “Angel of Siberia.” Elsa also started a Swedish Aid Organization for prisoners of war. But her work was curtailed during the October Revolution of 1917 -1918. However, she made many trips between Sweden and Siberia, but was arrested at Omsk in 1919, and convicted to death by a firing squad. To her good luck the death sentence was later revoked, though she had to languish in jail till the end of 1920. Back in Sweden, Elsa’s concern for the POWs saw her actively involved in fund raising for them. She soon moved to Germany and served at a Rehabilitation Centre for POWs in Marienbom-Schmekwitz. She even spent her own money and bought a mill (Schreibermuhl) surrounded by vast property, close to the Rehabilitation Centre. The fields, meadows and forests were used to grow potatoes and other crops, so that these men could earn their livelihood by cultivating the land. She was tireless in her efforts to better the lives of these men who had suffered in the war. 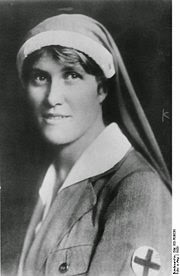 In 1923, she went on a fund raising tour of the United States for six months, in her Swedish Red Cross uniform. People were interested to learn of her experiences in Siberia, during and after World War I. They were generous with their donations. In 1924, she started ‘Neusorge’ a home for orphaned children of POWs at Mitteida. It had the capacity to accommodate 200 children. But when she married Professor Heinrich Robert Ullich in 1929, she had to move to Dresden. So she sold the mill and donated the money to a welfare organization. She also handed over charge of the orphanage, when assured that they would run it efficiently. Elsa’s burden was always for the soldiers who had been prisoners of war, and who needed to be rehabilitated into civilian life. When she moved to Harvard with her husband for a few years, she continued to help German and Austrian soldiers who arrived in the United States as refugees, looking out for opportunities whereby they could work and sustain themselves. During World War II, Elsa raised funds for the starving and homeless women in Germany. Two organizations started by Her (CARE- Cooperative for American Relief in Europe, and CRALOG –Council of Relief Agencies Licensed for Operation in Germany) brought in sizeable donations from Germans and Americans. ‘Save the Children’s Fund’ was also another of her interests. She travelled all over Europe giving lectures on the plight of children and their various needs. Elsa was honoured by the Silber Badge of the German Empire, The Royal Order of the Seraphim from Sweden, and was also nominated for the Nobel Peace Prize five times. She died of bone cancer in 1948 and was buried in Sweden. The war brought many heroines in different nations. But Elsa’s unflinching devotion to soldiers, who spent the best years of their lives in the trenches of war, was something unique. She was worthy to be honoured.